At the beginning of each new year, many people are resolved to do things differently. “This year I am going to the best me yet!” they proclaim, only to end up discouraged and right back where they started. The truth is, a few simple steps can make a big difference in your fitness. Here are five you can take in 2018. Be consistent: Doing a few things consistently generates more positive results than stopping and starting throughout the year. Schedule a convenient time for exercise and stick to it, no matter what. You may find, as many people do, that getting up a little bit earlier and giving yourself 45 minutes of vigorous exercise is a great start to your day. Mix it up: Your body thrives on doing new things. So don’t settle for the same old exercise every day. Be consistent with your workout but keep mixing in new challenges, even if that is just adding a few extra reps to your routine or running when you usually walk up the hill. Add a friend: Studies show that people who train with a partner are much more inclined to follow through on their fitness commitments. A friend or family member can train with you or it can be a fitness professional who is there to push you along the right path. Hydrate: Your body and muscles are composed of water so hydration is essential to any fitness program. A gallon of water a day will not only help you gain muscle mass but will also help you become more lean. In addition, it will make your skin shine! Eat more: That’s right, eat more! Studies show it is optimal to eat small, nutritious meals every couple of hours. That means you need to stop snacking on junk and start preparing your food at home so those mid-morning and mid-afternoon snacks are good and healthy, not just sweet and tasty. Try these Five Fitness Tips and make 2018 your fittest year ever. Wishing you happiness and health! Cora Kasperksi, owner of Laguna Fitness, is happy to answer any questions you may have. 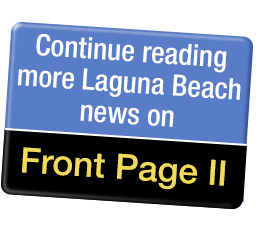 Laguna Fitness is located at 1999 S. Coast Highway, 949-939-2672, www.lagfitness.com.